It’s no secret that Salesforce is aggressively pushing its social agenda with product developments. Chatter, the company’s “Facebook for the Enterprise,” was recently updated with Facebook and Twitter-like features, including likes, @replies, trending topics and more. And today, Salesforce is injecting social into the new version of Service Cloud 3, the company’s customer service SaaS application. As we’ve written in the past, the Service Cloud aims to capture crowdsourced pools of knowledge floating across the internet, combine this data with CRM functionality and provide a platform for commercial customer service, potentially replacing traditional on-premise contact center technologies which are disconnected from knowledge (i.e. social) that can be found in the cloud. To date, more than 15,000 customers have deployed the Service Cloud to power and deliver customer service. While the previous version allowed agents to answer questions on a company’s Facebook page, Service Cloud 3 provides a deeper integration with the social network. Companies will now be able to convert Facebook wall posts and comments into cases within Service Cloud 3. Salesforce has also added the same functionality for Twitter and allows agents to create cases and share knowledge from Tweets and conversations. And a new Radian6 AppExchange app will let agents work entirely within Service Cloud 3 but still engage with customers via Twitter, Facebook and other social channels including blogs, video and photo sharing sites. 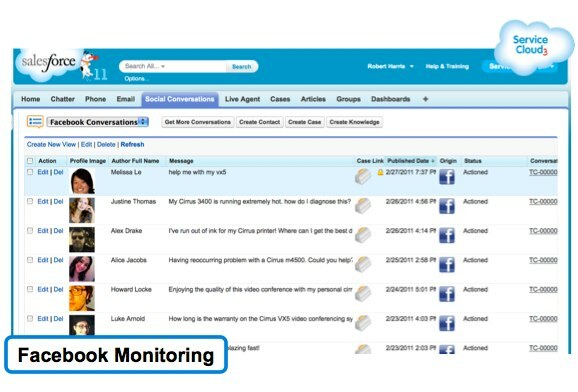 Service Cloud 3 will give companies the ability to implement live chat between agents and customers (courtesy of the company’s Activa Live acquisition last Fall). Companies can embed the Social Agent into their web site for chat functionality between representatives and customers. Analytics have also been added to the new Service Cloud, with the ability to generate reports on social channel interactions, customer conversation analyses, and social dashboards to help identify trends. And teams can also collaborate in Chatter around how to answer questions and to get feedback on published knowledge articles for increased accuracy. Readers can access an article’s history, contribute comments, and see input from internal experts. The Service cloud console now allows agents to follow important cases in Chatter, to receive realtime updates on status and to collaborate around how to solve the customer service issue. resolve issues faster. 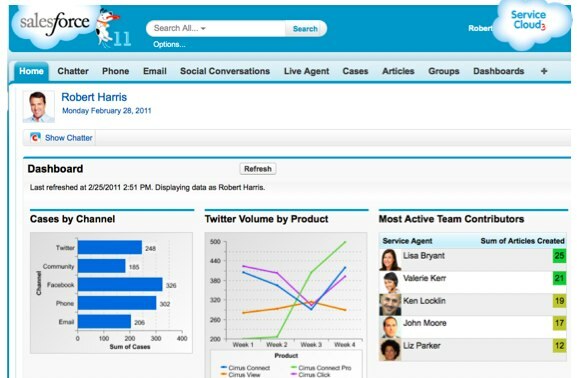 Put simply, Salesforce made the Service Cloud a whole lot more social in this release. While this is unsurprising considering the company’s recent emphasis on Chatter and its social agenda, it does make me wonder if this trend is a sign of things to come. I’m curious if we’ll see the Chatterification of Salesforce’s database offering and other products.